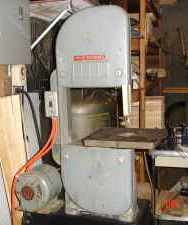 The 10" Delta Homecraft Band Saw Model No. 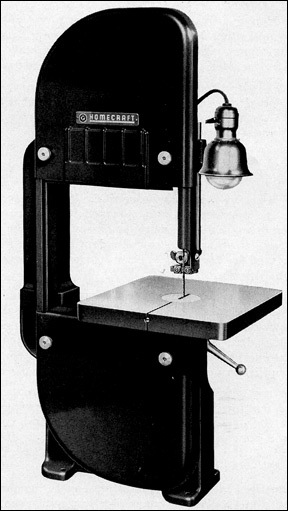 28-110 was first introduced along with the Homecraft Power Tool line in 1949. 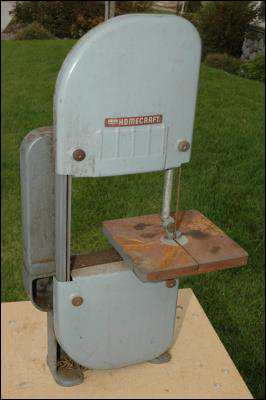 This bid 10" Homecraft Band Saw was for curved and straight line cutting. The No. 28-110 Homecraft Band Saw has an unusually rugged frame cast in only two sections. The hollow cast upper arm prevents all springing and twisting of frame. The heavily ribbed, finish ground cast iron table measures 10" x 10" with a removable aluminum table insert which prevents damage to blades and provides support for work at all times. The table tilts 45 degrees for angle cutting, with accurately graduated scale showing the exact degree of tilt. A leveling stop screw is provided so that table can be quickly and accurately returned to level position. The upper and lower guides are fully adjustable. Square steel pins are used as guides. The ball bearing blade support is adjustable independent of the blade guides. All mechanisms for adjusting the blade tension, for raising and lowering the upper blade support and guide, for tilting and locking the table and for setting the table square with the blade, are simple and foolproof. The upper wheel runs on needle bearings while the lower wheel runs in two oil impregnated bronze bearings mounted in the base casting. Wheel tension and tracking adjustment is in handy position on the upper arm casting. The wheels and blade are completely guarded. Magnesium spoke wheels are used that are light in weight, accurately balanced and reduce flywheel action. The machine can be stopped quickly. The cutting capacity under the guide is 6 1/2" and will take a full 6" cut in hardwood. This band saw is compact in design and takes up little space in your home workshop. The wheel tension and Blade tracking adjustments are located on the upper arm casing. The blade guides and ball bearing blade supports are located both above and below table and are fully adjustable to different size or type blades. The blade guide and blade supports adjust independently, and all adjustments are easy to get at, safe and accurate. The large 10" x 10" table, tilts a full 45 degrees to right. The trunnion is heavy and tilting actions is smooth. The handy scale at rear tells you the angle of tilt. Complete protection is provided by front blade guard which adjusts up and down. The Delta Homecraft Band Saw will cut hard wood up to 6" thick and has a throat capacity of 9 5/8". No. 28-110 10" Homecraft Band Saw with wheel guard, 1/4" saw blade and 5" pulley. This was a capacitor start, 115 volt, 60 cycle, 1725 r.p.m. motor with ball bearings and a 5/8" diameter shaft. No. 882 Lamp Attachment - Brings light to work when needed -- independent of shop lighting system -- no glare -- can be swung out of way by a touch of the finger -- uses 15 or 25 watt bulbs. Lamp Attachment with shade, socket, cord, four flat links, bolts, spacer and attachment bracket. No. 28-810 Sanding Attachment - Consisting of flat and curved platens with guides and mounting bracket. Diameter of Saw - 8"
Maximum Thickness of Cut - 2 1/4"
Maximum Thickness of Cut at 45 Degrees - 1-9/16"
Maximum Width of Dado Cut - 13/16"
Table in front of blade on capacity cut - 11-5/8"
Maximum rip to right of blade - 24"
Table working height on steel stand - 34 1/2"